A 150mph top speed is the unruffled stuff of mid-level hatchbacks today, but when it was achieved by the Sunbeam ‘Blue Bird’ in 1925 it was a truly astonishing feat. 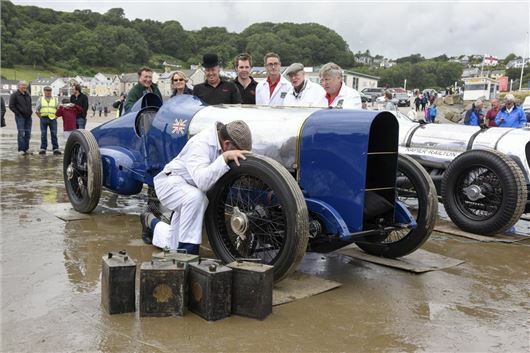 So to celebrate the 90th anniversary of the achievement, the legendary Blue Bird went on a demonstration run this week at the Pendine Sands in Carmarthen, Wales, where the original record was set. Sir Malcolm Campbell set the record in 1925, so fittingly his grandson Don Wales – also a land speed record holder – was at the wheel for the demonstration in the fully restored original car. Don said: "My grandfather was a remarkable man and for us to remember him and honour some of his achievements in this way is very humbling. It was an honour both to follow in his footsteps and to drive this iconic car on such a special occasion." The Sunbeam is powered by an 18.3-litre V12 engine pushing out 350bhp. But this is no ordinary engine – it’s a Manitou Arab aero engine, more usually found in naval seaplanes. Originally the car set the speed record in 1922, driven at Brooklands by Kenelm Guinness at a speed of 134mph. It was later pushed to 146mph at Pendine after Sir Malcolm bought it, painted it blue, and renamed it Blue Bird. It was a year later, at the same place, that the 150mph mark was passed. The project to rebuild the car began in January 2014 after the car was passed from pillar to post following on from Sir Malcolm selling it. It was restored originally in 1957 but over the following decades fell into disrepair, culminating in an incident in 1993 when a piston decided it didn’t want to live in the engine any more and swiftly exited stage left. It’s estimated it took 2000 hours of work by engineers and volunteers to get Blue Bird back to the near perfect condition it’s in today.